Some of those wearing skates are friends, some rivals, some acquaintances, and some mere faces in the crowd. But when you come to expect to see those faces and they are no longer present, their absence does not go unnoticed nor unremembered. Do not linger on their no longer being there, but linger on what it was like to have them there. Below are links to stories, obituaries, photo galleries, and other memories of beloved skaters than have gone before us. Daryl died after a battle with ALS. It was a battle we didn’t know about as he returned to his family in Wisconsin for treatment. Phone calls and e-mails to him went unanswered, some thought he was busy with a new job. Most skaters learned of his passing shortly after the North Shore Inline Marathon. A group of skaters were upstairs in a restaurant and wondered aloud where he was. A google search provided the news. Daryl’s passing has been remembered at a Memorial Skate in his honor at Elm Creek each year since, and the establishment of a bench in his honor at Elm Creek. Click here for a great tribute by Olympian Jeff Klaiber. Bob Fenn was well known among long track ice speedskaters throughout the world. The Milwaukee based coach was Olympic Gold Medalist Shani Davis’ and inliner KC Boutiette’s coach, and coached many Twin Cities skaters formally and informally throughout his decades in speedskating. Bob Fenn died October 8th. Turn one at the Pettit Center will never be the same. Fenn had a reputation for pushing his skaters further than they thought they could be pushed. His strategy of hard workouts the week of meets was controversial, but the results often spoke for themselves. Fenn worked with the worlds best, but also fledgling skaters. Years ago Karri Cox and I spent an hour with him in the Pettit Center training room talking technique, strategy, conditioning, and most memorably equipment condition. Local skaters including Greg Oly, Melissa Dahlmann, Matt Trimble, and Theron Sands (of Illinois) all had extensive experience with Coach Fenn over the years. It is particularly disappointing that Fenn would pass just months before the Olympics for which he had spent years preparing skaters. Joan Gregg’s InlineSkateMpls Skater Archive. I met Joan on my first night on inline skates at the Metrodome in 2008. I recall her joyously retelling the tale of winning her age group and skating an hour and 45 minute marathon; she had the trophy with her. At the time I wasn’t sure I could beat her, actually, I was pretty sure I couldn’t. It was a pretty big motivator, not wanting to lose to Joan. She was a Metrodome fixture in her pink Bonts. As the years went by and I sped up and she slowed down, I don’t think either of us forgot that first meeting. Her Pioneer Press obituary simply reads: Born June 28, 1938, died peacefully on June 4, 2016. Joan was a marathon-winning in-line skater who loved cats and dogs, was active in her church, and earned over 40 years of sobriety. She was loved and will be missed. Chet was an inline skater, but was best known to inliners for his work at the Rollerdome. Many a cold winter’s night Chet kept vigil at the Dome. He could be found taking tickets, renting skates, and yelling “Three to a paceline!” at skaters that refused to listen. Chet could have a gruff and curmudgeonly exterior at times, but it belied a kind heart and sense of humor. The last line of Chet’s obituary reads: Chet requests the Minnesota Twins send pall bearers to let him down one last time. Jan was the perfect representative of our team, of all skaters, and human beings in general. His always positive and upbeat energy was infectious to anyone one who was around him. He was a long time Team Rainbo member and a great friend to many of us. We know he will be skating on the clouds. He will be missed greatly but never forgotten. We love you Jan, thank you for being a part of our lives. We miss you Andy. A Kostka Memorial skate has been held at Elm Creek each year and a memorial bench has been established there in his honor. What a shocking loss to the community. 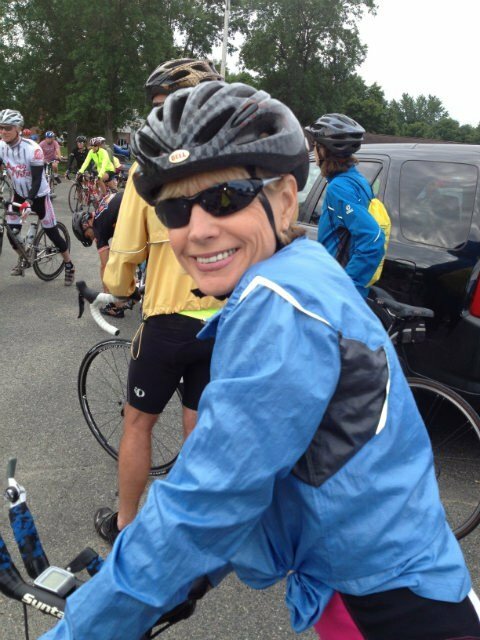 A bike race crash claimed the life of Cheri and scared all that lead an active lifestyle. Cheri lives on in the donated organs that saved others lives, and in the memories of her family, skaters, bikers, and partner Bob Losby. The Fun On The Run, Cheri Ulemen’s Fantastically Fun Kid’s Run is held annually in Eau Claire in her honor. Chris was a member of the much loved Bladey Bunch out of Wisconsin. Herb’s obituary, linked to above, mentions a post race lunch. I was fortunate enough to have been at that lunch. It was the only time I would meet Chris. When he had to leave, it was apparent a giant had left the room.